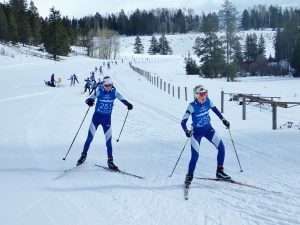 The Jackson Hole Ski & Snowboard Club is proud to present the 27th Annual Skinny Skis Moose Chase Nordic Ski Race on February 16th at Trail Creek Nordic Center in Wilson, WY. This premiere Nordic race includes a 30k, a 15k, 5k, 3k, and a free 1/2k. 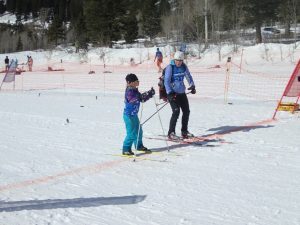 Competitors can skate or classic ski the course. 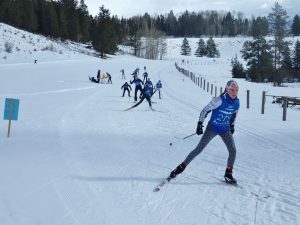 The Moose Chase is the first event of the JHSC’s Triple Crown Series. Register early for best pricing! Despite 24 inches of snow, our grooming team has been hard at work keeping the single track trails in great shape! Imagine a pair of 7 year old boys, each with an age appropriate cantankerous streak, alone in a room with nothing but a pair of premium quality goose down pillows. When you return to the room fifteen minutes later what should you discover but a cloud of gently dancing goose down feathers filling the air, not to mention a pair of guilty looking boys. While the boys may or may not be here today, the gently dancing champagne snowflakes are here in abundance once again. 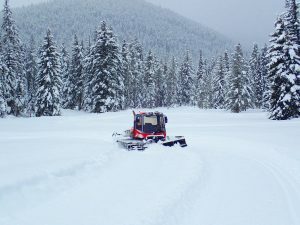 There was about 6 inches at the beginning of grooming with an additional 5 falling through the course of today’s efforts. As of 1:15 PM the gossamer crystals are continuing to fall at a moderate rate with no wind and a temperature of -6ºC/21ºF. Today’s grooming began with a Pisten Bully skate/classic pass of the entire Moose Chase Course which was followed with a skate only pass. The extreme dry and light nature of the recent snow resulted in some outflow around the tiller and slightly rustic conditions, but a fair number of skiers have been out and reporting in with nothing but smiles when encountering the magical Nordic environment prevailing today. Groomer’s choice for today is the Moose Chase Course. 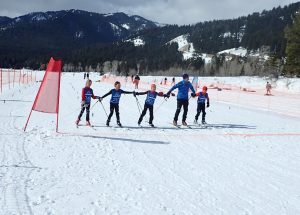 What builds endurance, strength, coordination, and is lots of fun? 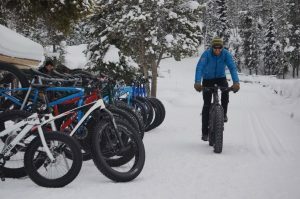 Nordic skiing, snowshoeing and fat biking at Turpin, that’s what! Our trails continue to be firm and fast. We’re open until March 10, that’s only 4 weeks away. Don’t miss an opportunity to enjoy this special place, be here now! 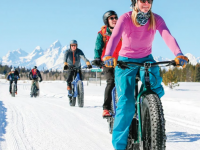 Buy Your Turpin Meadows Trail Pass! 9:30am: The levee and Stilson are groomed and in great shape. I am heading to the school fields shortly and should be done around 11:00. It’s a little windy with some drifting snow in GTNP. 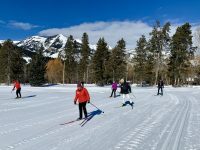 If you love to ski go into the park today from Taggart to South Jenny. The moose are out and taking advantage of the amazing Nordic conditions. Be on the lookout for these fuzzy guys as they seek refuge from the deep snow. The course received extensive blade work over the last few days to assist w/leveling the track. Expect softer skiing to remain as plenty of the white stuff is expected to accumulate through all next week. Enjoy! 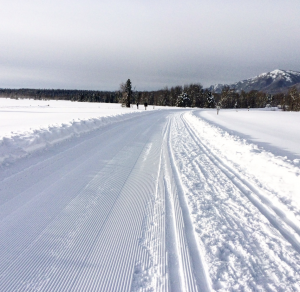 Note: Track in excellent condition, thanks to Friday intensive grooming. 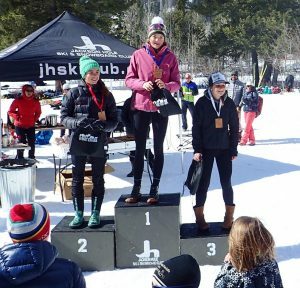 It’s day two of the IFSA Junior Freeski – Regionals at Grand Targhee! 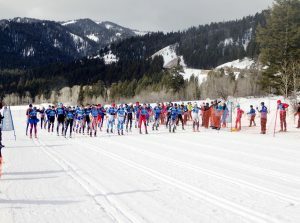 As much a spectator event as a competitor event, make sure you take the Teton Vista Traverse to view the venue at the base of Peaked Mtn. The young rippers will be sending technical lines, big airs, dropped cliffs, and floaty tricks. Runs are scheduled to begin at 10am, pending favorable visibility and weather. We will remain in a Winter Weather Advisory until 11:00pm tonight. 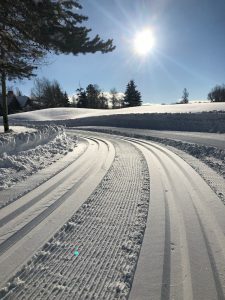 Cross Country/Fat Bike 15k: XC OPEN (Last groomed AM 2/10/2019), Fat Bike OPEN. All trails above groomed this morning except Powerline, Flatline and Heart Attack. 8″ of new snow from yesterday. 27F degrees, overcast, slight breeze. Road plowed and snow packed. Parking areas plowed. Expect soft conditions again today. 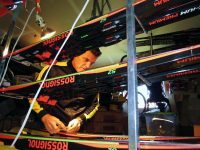 Classic skiing would be my choice. Quite the battle out there this morning. I set the classic track, but there’s a good bit of drifting snow and many sections filled in before I finished my second lap. I was unable to finish setting the skate lane due to mechanical issues. If you do head out there, be ready for an adventure. Made 2 passes, 3ish laps wide. Heavy drifting required establishing trail again. Snow was super soft underneath. Winds while grooming started drifting snow before I finished. If winds persist through the night, heavy drifting will likely occur. Use caution when walking. 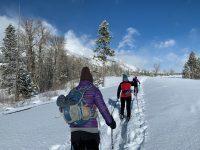 Snowshoes encouraged and recommended. 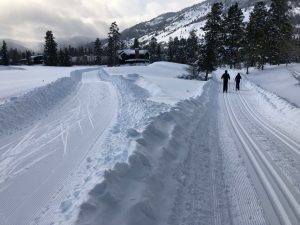 Sunday: Once again, plan to reset both classic and skate tracks this morning. Should finish by 930am. 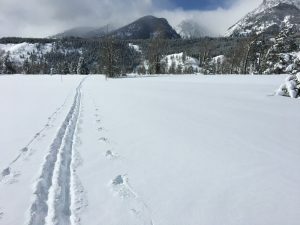 Trail is snowmobiled in, but not groomed. Planning to roll it out tomorrow…stay tuned! 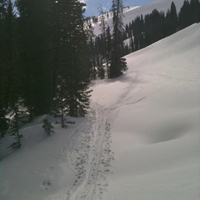 All Singletrack in Teton Springs is groomed. Enjoy! It’s all good in the hood! 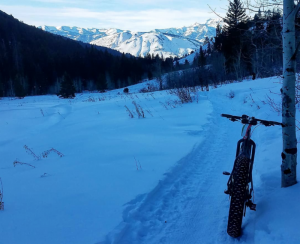 Trails may be a little soft if temperatures don’t drop. Please use discretion. 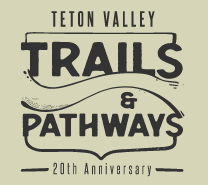 For more info on Teton Valley grooming, visit their grooming page. 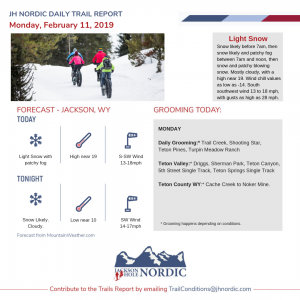 Sign up for Daily or Once a Week JH Nordic Trail ConditionReports to know what’s groomed, what’s happening first thing every morning – or just Saturdays.